After a grueling 26 hour surgery that separated conjoined 10 month old twins Knatalye Hope and Adeline Faith Mata the operation was deemed successful and both babies seem to be doing well. The girls were connected at the abdomen, sharing a liver, also affected are the diaphragm, pelvis, intestines and the lining of the heart. The surgery took place in Houston at Texas Children’s Hospital with a massive team to perform the numerous surgeries. The 12 surgeons, 8 surgical nurses and 6 anesthesiologists had been preparing for months using three dimensional models of the conjoined organs. Their combined preparation and efforts made this the first and most successful separation for this particular configuration. Surprisingly conjoined twins can occur once every 200,000 births, but sadly most do not survive. According to the University of Maryland Medical Center, about 40 to 60 percent of conjoined twins are stillborn and only about 35 percent live one day. After that conjoined twins only have a 5 to 25 percent survival rate, reports Yahoo News. Soon-to-be parents, Elysse and Eric Mata were thrilled to be expecting their second and third children and 5 year old Azariah was looking forward to being a big brother. During an ultrasound the doctor froze in place and said, “We think they are conjoined.” The doctors spoke to ELysse about terminating the pregnancy, but that was something that they would never consider doing. Deciding to let God have His way with their children, they placed them in His hands. 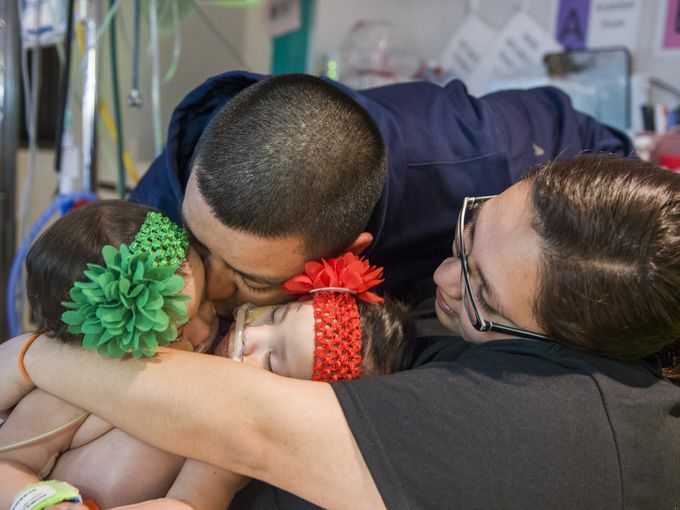 Doctors soon recognized that the girls had their own heart beats and the little fighters held on until the doctors could perform their own version of a miracle. The twins are resting at Texas Children’s Hospital. On February 17, the little girls were officially separated in surgery. A team of doctors pulled off an intensive and risky surgery.